About the Book:Who Will Cry When You Die ? We have all wondered what will become of us when we cease to exist; whether we are living our lives to the fullest or just barely surviving. Who Will Cry When You Die? gives you 101 simple ways to live a worry-free life. Some key sections include Discover Your Calling, You're Your Monkey Mind, Look For The Higher Meaning Of Your Work, Learn To Be Silent, Have a Living Funeral, Listen to Music Daily and Become The CEO Of Your Life. Some of them are lessons we all know but don't practice, others are not so popular. The book is great to put things in perspective and get a lot more out of your life, than what you are currently getting from it. Hear it straight from the life management expert who has been instrumental in the improvement of many lives all over the world. The author was ranked seventh on the International Leadership Professional Gurus of 2012. If you find yourself dreaming of better days and putting off things because you don't have the time and energy – this is the book for you. This self-help book will not only help you in your journey to find inner peace, but you will be satisfied with your life's accomplishments. A self-help book that has the potential to give you a lot of return for the small investment that you will make by buying it. 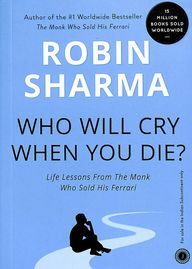 Robin S. Sharma is the author of 11 international bestsellers, including the famed bestseller The Monk who Sold his Ferrari. He is a Canadian lawyer, writer and leadership specialist of Indian descent. He founded Sharma Leadership International Inc., a worldwide leadership consultancy that has worked with Nike, FedEx, Unilever, Microsoft, Panasonic, IBM and many more reputed organizations. Book: Who Will Cry When You Die ?